Providing you the best range of cap sealing machine, horizontal single side sticker labeling machine, packing conveyor, ropp screw capping machine, round bottle sticker labeling machine and turn table scrambler & un scrambler with effective & timely delivery. We have gained a remarkable position in the concerned industry by offering a distinguished range of Packing Conveyor. Our offered conveyor is manufactured using high grade components and ultra modern technology to meet the international quality norms. 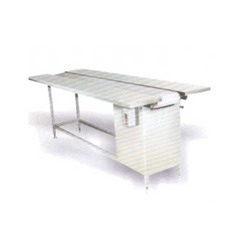 Our offer conveyor is widely used in various industries for packaging applications. 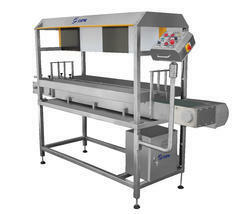 In addition to this, our esteemed clients can avail this conveyor from us at most competitive price. 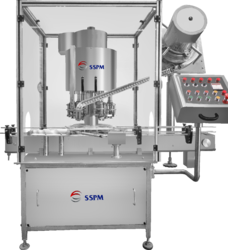 SSPM - Cappers are tough stainless steel spindle cappers designed to automatically place and tighten a wide variety of Ropp Screw Capping Machine onto containers in a sanitary environment. Each tightening spindle is spring loaded and driven by a torque control device for increased disk-to-cap contact and reduced disk wear. This unique design eliminates the need for transmissions, belts, pulleys, and universal shafts which reduces the size of the machine, lowers maintenance time, and expands the capability and adjustability of the capper. The Capper can accommodate standard closure sizes ranging from 10mm – 120mm with additional components/ change parts. The filled bottles are automatically transferred to sealing/ capping station through star wheel. Caps are picked up automatically before bottles are conveyed to capping heads. The sealing station consists of ROPP capping head with cap torque control device. The pressure on the bottle can be reduced and thereby ROPP capping can be done on glass or PET bottles without change in any change parts. However, this is subject to strength of the bottle. The height of capping head can be adjusted to suit bottle height. A Motorized height adjustment is also available optionally for ease and faster setting and changeover. 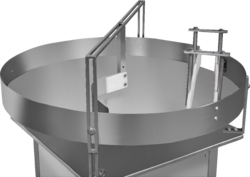 The height of cap feeding hopper and chute are automatically adjusted to suit bottle height. 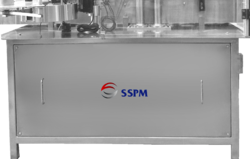 SSPM- Automatic Bottle Sticker Labelling Machine to stick self adhesive label on 250 ml to 500 ml Bottle (cGmp Model). Conveyor will convey the bottle for Labelling. Specially designed Drive Stepper/ Servo Motor Mechanism for sticker releasing. In built dispensing Unit for dispense Label. Wrap around Mechanism to wrap the label on product. Micro Controller/ Plc Controlled Product Sensor to sense the gap between two Labels. In Built reel mechanisms to hang the roll. Microprocessor/PLC Based Electronic Control System for total operation of the machine with programmable feather touch screen Or L.C.D. Display Facility available. We are an acclaimed name engaged in offering our precious clients a superior quality range of Turn Table Scrambler And Un Scrambler. We manufacture this machine by utilizing the supreme quality components and innovative techniques under the fruitful supervision of our trained professionals. To control the speed of the turn table, we connect a variable frequency AC drive to the motor. The provided machine is available in market at affordable rates. SSPM- Loading and accumulating turntables are manufactured with stainless steel frames that add durability and stability to the design of the turntable. Variable Frequency AC Drive is connected to motors on turntables that allow the operator to control the speed at which the turntable top rotates to meet production needs. Loading turntables are manufactured with an adjustable bottle guide structure that moves the containers to the outer side for loading onto a take away conveyor. Standard turntables are manufactured with a height of 900 mm. The turntable levelling legs can be adjusted to change the height by approximately 50 mm in either direction. Suitable for all types of stable containers. Adjustable guide for all sizes of container alignment. Noise less and jerk free performance because of reduction gear. Vibration free performance because of square frame and levelling pad. 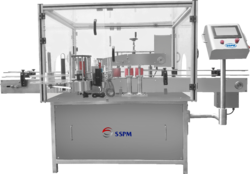 SSPM- Automatic vertical rotary vial sticker is a labelling machine to stick self adhesive label on 2 ml to 250 ml Vial (cGMP Model) with change parts required for different sizes of Vial. Structure of SS – 304. The conveyor will convey the vials for labelling. Specially designed drive stepper / servo motor mechanism for sticker releasing. Specially designed star plate for vial labelling. Wrap around mechanism to wrap the label on the product. Micro Controller / PLC controlled product sensor to sense the gap between two labels. Inbuilt reel mechanism of size: 305 mm to hang the roll. Anti-vibration pad will be provided to avoid vibration during process. Microprocessor / PLC base electronic control system for total operation of the machine with programmable feather touch screen or LCD display facility available. 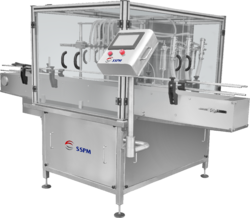 SSPM- Bottle Inspection machine is used for an efficient inspection of transparent filled bottles or vials, also to manually identify and remove defective products. The operator can manually remove bottles/ vials with various defects like visual foreign particle detection, damaged bottle, improper filled bottle, improper capped bottles/ vials. Fluorescent Light and Magnifying Glass. The Bottles or vials will be charged manually into the Un-scrambler/ Turn Table. This turn table is directly connected to an Inspection belt. The Inspection belt is installed with Fluorescent tube light and magnifying glass, when Bottle/ Vial pass through magnifying glass, operator can easily identify the visual defects, which sometimes are not visible with usual eye sight. Physically damaged products are manually collected from conveyor belt. 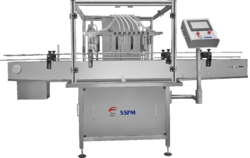 Conveyor belt is installed with Start/ Stop functionality from Foot switch to easily stop the conveyor belt to sort defective bottles/ vials moving out of inspection zone. Inspection Machine structural components are manufactured from Stainless Steel 304. Looking for PACKING LINE EQUIPMENT ?